The eNotes Blog: eNotes for Back-to-School (#eNotes4BTS): Win a Lifetime eNotes Pass and $500 Grant! We are amping up for back-to-school so that we’re prepared to help our eNoters with summer reading, pop quizzes, and upcoming exams. To kick off the season and help you transition from summer sun to classroom fluorescents, we’re excited to announce the #eNotes4BTS contest! All the prizes are designed to help you transition to back to school, and everyone is a winner! One grand-prize winner will receive a $500 grant and a Lifetime eNotes Student Subscription. Three runner-up winners will receive a 1-year eNotes Student Subscription, a $49.99 value. Everyone that enters will get 50% off an eNotes Student Subscription. Sent via coupon code after the contest ends. 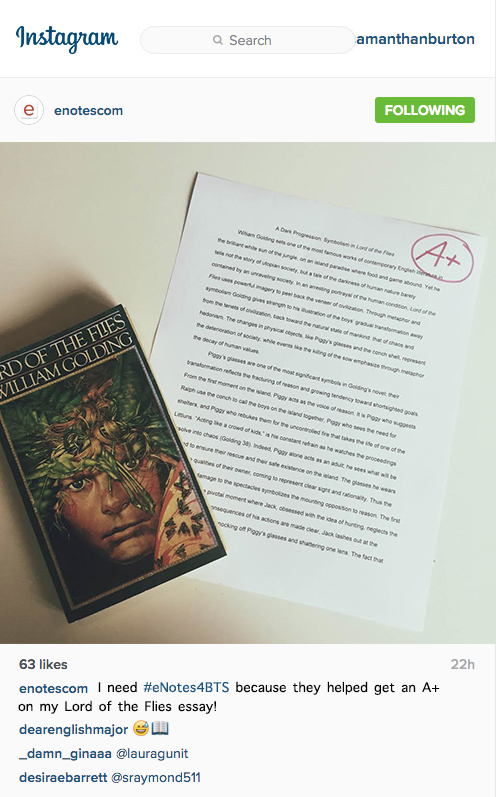 Let us know why you’ll need eNotes for back to school on Twitter and/or Instagram. You can simply tweet it with text, or use images and videos on Twitter or Instagram…the more creative the better! 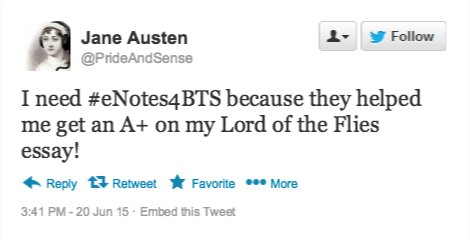 *You MUST include the hashtag #eNotes4BTS to enter. Entries accepted August 5 to August 26, by 11:59 p.m. PST. So enter the #eNotes4BTS contest to get a leg up on 2015-16 and turn all of ^this^ into this. Questions about the contest? Comment below or send an email to dispatch@enotes.com and we’ll be happy to help!